Summary Four-bay dual core Intel Core i3 NAS with lots of ports and wide range of downloadable apps. In order to help buyers find the right NAS, ASUSTOR breaks its product line into multiple categories. We have already reviewed products from the "Personal to Home" 2 series, products from the "Home to Power User" 3 series and the AS-604T from the "Power user to Business" 6 series. This review will focus on the AS7004T, also a member of the "Power user to Business" family. As you might suspect, the 7 series boasts better performance and, of course, a higher price than the any of the lower numbered series. The 7 series includes our review model, the 4-bay AS7004T, as well as an 8 bay (AS7008T) and a 10 bay model (AS7010T). All 7 series NASes are based on a dual-core 3.5 GHz Intel core i3 processor, 2 GB of SO-DIMM DDR3 memory (expandable to 16 GB) and multiple expansion ports including three USB 3.0 ports, two USB 2.0 ports and two eSATA ports. All models also feature two Gigabit Ethernet ports and an LCD panel. The 8 and 10 bay models also have a PCIe Expansion slot for an optional 10 GbE card. For audio output, the 7 series products drop the 3.5mm audio jacks found on the 2 and 3 series products in favor of a S/PDIF digital audio output port. The 7 series also boasts XBMC Version 13.1, which supports 4K video output via an HDMI 1.4 port. Front panel callouts and LED meanings are shown below. Fortunately, there is an LCD panel and navigation buttons to more clearly communicate status. Rear panel callouts are shown on the AS7008T's panel view below. The PCIe expansion slot at the upper right next to the reset button on the AS7008T and AS7010T only is not marked. As noted above, all 7 series models are powered by an Intel i3-4150 running at 3.5 GHz. This is a significantly more powerful processor than found on the lower series ASUSTORs. 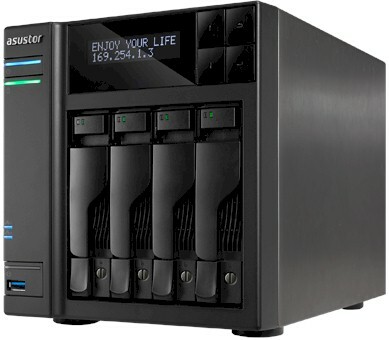 To compare components, I selected the ASUSTOR AS-304T and AS-604T as well as the QNAP TS-470 Pro. The QNAP also features an i3, but running at lower clock speed and also ships with 2 GB of memory. Like the AS7004T, it can be expanded up to 16 GB, but not by the user—not easily at least. The AS7004T's memory expands easily; just remove the case cover, lift up the flap on the exposed backside of the mainboard and insert the SoDIMM. There's even a YouTube video you can follow. The table below summarizes the key components for these four products. The image below shows the AS7004T's mainboard. As you can see, the majority of the key components are covered by a massive heat sink connected via heat pipe to a radiator. The photo below shows the backplane shot from the rear of the device. The main board and all connectors are to the right. The heatsink's radiator is mounted so that the large (120mm?) case fan is right in front of it. We loaded the NAS with four WD Re 3 TB (WD3000FYYZ) drives on permanent loan from WD. Power consumption measured 62 W with the four drives spun up. We were not able to get a power consumption reading with drives spun down because the idle drive spindown function didn't work. Fan and drive noise would be classified as low. But the review sample periodically spun the fan up to full speed over the course of a minute in 10 second or so steps, then stepped it right down again. ASUSTOR thinks this is a review sample flaw because they were not able to reproduce the behavior. So we will check this again on the replacement sample they're sending and update.